Image caption Mr Clegg said the coalition was a "package deal"
Nick Clegg has said delaying changes to Commons constituency boundaries is "perfectly reasonable" after Lib Dem peers joined with Labour to oppose their introduction in 2015. Peers voted on Monday to postpone the current boundary review - which would cut MP numbers by 50 - until 2018. The Lib Dem leader defended his party's stance, saying the Conservatives had not "honoured" pledges on Lords reform. No 10 says the Tories will try to overturn the vote at the next debate. The boundary changes, approved in principle by Parliament last year, would see the size of the Commons reduced from 650 to 600 MPs with England, Scotland, Wales and Northern Ireland losing 31, seven, 10 and two seats respectively. The Boundary Commission is currently examining how individual constituencies across the UK will be redrawn. The Conservatives say the changes - making all seats roughly the same size in terms of registered voters - would help address a historic bias in the electoral system but Labour have accused them of "gerrymandering" - manipulating areas to get a favourable result. After last summer's dispute over proposed elections to the House of Lords, the Lib Dems have said they will not support the changes being implemented in time for the next election - scheduled for 2015. Mr Clegg defended the actions of Lib Dem peers, including ministers, who joined with Labour to pass an amendment to the Electoral Registration and Administration Bill to postpone the boundary review to 2018 at the earliest. Peers backed the Labour amendment by 300 to 231 votes in what BBC parliamentary correspondent Mark D'Arcy said was the "first occasion" in the coalition's lifetime in which Conservative and Liberal Democrat ministers were whipped to vote in opposite lobbies. 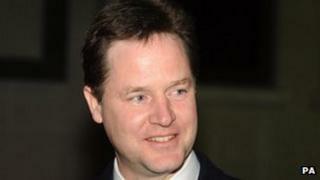 Mr Clegg said the coalition partners had had a number of disagreements over political reform over the past two and a half years. He suggested he had been subject to "highly aggressive and personalised attacks" by the Conservatives during the 2011 referendum on changes to the voting system for Westminster elections. "You will remember the House of Lords debate where the Conservative Party decided not to proceed with reform even thought it was in their manifesto and the coalition agreement," he told Radio 4's Today programme. "I have been very open about the fact that a coalition, by definition, is a package deal." He rejected suggestions that the Lib Dems were "getting their own back" but said that "when one side... does not honour their side of the agreement, it is perfectly reasonable for the other side" to defend their own interests. He added: "We are leaving the boundary changes on the statute book and saying we should miss a beat and do it in the next Parliament, not this one." If it is to become law, the Lords amendment will need to be approved by MPs when the bill returns to the House of Commons. Downing Street has said the government would seek to overturn the Lords amendment when the legislation returned to the Commons towards the end of its parliamentary scrutiny. Speaking on Monday, a No 10 spokesman said the prime minister "remains of the view that we should have fewer MPs to cut the cost of politics, and more equal size constituencies so that people's votes have more equal weight".